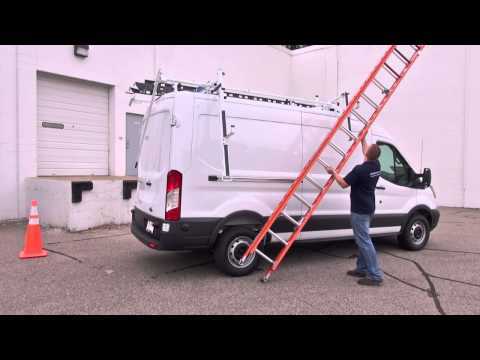 The ErgoRack was designed to reduce muscle stress, eliminate risk of injury and speed the job of loading and unloading ladders from a work van. Removable handle – easy access for operators of any height. Notes: Ship thru configurations are available. 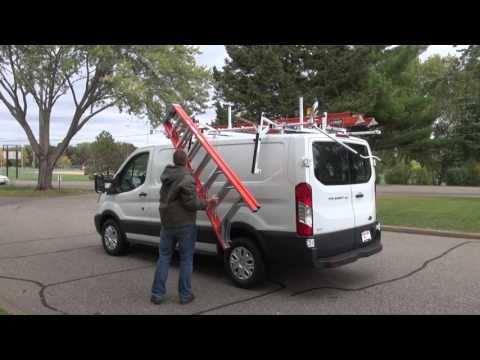 Crossbar spacing and the vehicle’s wheelbase length will dictate the ladders that can be carried. Crossbars can be spaced at six, seven, or eight feet. If carrying a long extension ladder and a short step ladder, a three crossbar rack is suggested. Contact Prime Design customer service for application specific questions. Check the vehicle manufacturer’s recommendation for roof capacity weight limits. A wide range of accessories are available including conduit carriers, light holders, and more. **One 5′ connecting bar (FEA-0022) is required per rotation feature for 8′ crossbar spacing. FEA-0022 is ordered separately. Notes: Crossbar spacing and the vehicle’s wheelbase length will dictate the ladders that can be carried. Crossbars can be spaced at five, six, seven, or eight feet. A 3rd crossbar can be spaced four, five, six, or seven feet. If carrying a long extension ladder and a short step ladder, a three crossbar rack is suggested. Contact Prime Design customer service for application specific questions. Check the vehicle manufacturer’s recommendation for roof capacity weight limits. A wide range of accessories are available including conduit carriers, light holders, and more. 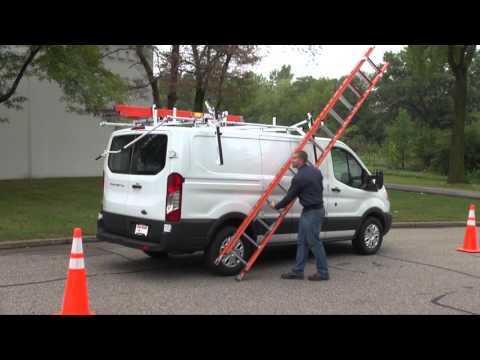 Notes: Crossbar spacing and the vehicle’s wheelbase length will dictate the ladders that can be carried. Crossbars can be spaced at six, seven, or eight feet. A 3rd crossbar can be spaced four, five, six, or seven feet. If carrying a long extension ladder and a short step ladder, a three crossbar rack is suggested. Contact Prime Design customer service for application specific questions. Check the vehicle manufacturer’s recommendation for roof capacity weight limits. A wide range of accessories are available including conduit carriers, light holders, and more.